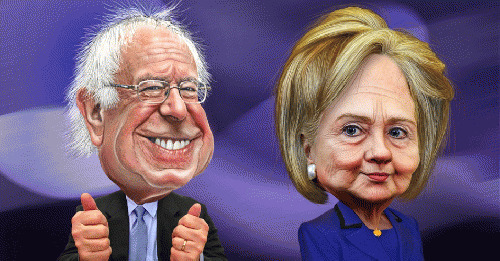 Does the Hillary, Bernie Battle Matter That Much? Tensions are flaring as the New York primary approaches. The candidates are getting tough with each other, and their supporters are getting even tougher. The New York debate was almost too painful to watch. But is the fighting really that warranted? Is there something at stake that runs deeper than personality differences, the first woman president, Clinton fatigue, or pie-in-the-sky Bernie? Since both candidates are so much better than the Republican crazies, does it really matter all that much whether Hillary or Bernie gets the nod? We are witnessing the first campaign since 1933 that directly challenges the essential features of our economy. We are now living through a 40-year neoliberal dystopia. Finally it is under assault. Any objective observer would note that Hillary operates within that neoliberal order while Bernie is its attacker. Neoliberalism refers to the set of theories and practices that swept through our political system (and many others) in the late 1970s. Put in its most simplified terms, it argues that prosperity for all will occur only if we... 1) cut taxes (especially on the higher income brackets); 2) cut government regulations on the private sector, and; 3) cut/privatize government social programs. This combination of policies, it is argued, maximizes economic efficiency and increases economic incentives which together continually improve and expand our economy. By the time Reagan came into office, both political parties had adopted this model. In short, order trucking, airlines, telecommunications and finance were deregulated. Taxes on the highest income earners were slashed. Cuts in welfare became the order of the day. Both parties tripped over themselves to "unleash" the private sector. Both parties also oversaw cuts in government employment and the privatization of government services. Corporate taxes as a percent of state and local revenues fell by half. Both parties acted as if any and all jobs in the private sector, by definition, were more wholesome than those in the public sector. And both parties competed strenuously for Wall Street campaign funds by eviscerating New Deal controls on speculative activity and the size of financial institutions. Goodbye Glass Steagall -- Hello too-big-to-fail banks. Not only did runaway inequality crash the financial system in 2007-08, but by then Wall Street was so large and so powerful that it could extract trillions of dollars in bailouts. Today the biggest banks are even bigger than before the crash. And during the current seven year recovery, 95 percent of all the new income created in the entire economy has gone to the top 1 percent. Runaway inequality is the new normal. Meanwhile, we live in a perpetual fiscal crisis as large corporations and the wealthy shift their money offshore. The richest country in the history of the world faces a crumbling infrastructure, barely potable water, decaying schools and a deteriorating environment. We lead the world in prisoners, but are second to last among developed nations in childhood poverty and labor rights, last in paid family leave and holidays, and nearly last in upward mobility. And we've mortgaged the future by placing our children under $1 trillion in student debt. Her direction is clear: Make it better because it's too strong to change fundamentally. She wants to tweak it so that it is fairer to people of color, the LGBT community, and women, not a small matter. She also wants to modestly rebuild the infrastructure, reduce student debt and ratchet up Wall Street controls at the margin. But her economic program is pure neoliberalism -- the liberal wing of it. Hillary starts by accepting ways of the world. Wall Street is there. It is powerful. Democrats need their campaign support. The conservative Congress is there. It must be worked with. She has trained herself to work from within. She believes she can deploy the many connections to the world of money and power the Clintons have amassed over the decades. Her economic programs speaks for itself. Corporations are central to it. She wants to provide tax incentives to entice corporations to repatriate their profits and keep jobs here. She wants to build government-private partnerships to invest in inner cities. She does not want to break up the big banks. She does not want a Wall Street speculation tax. And she does not want free higher education at public colleges and universities. This is "realistic" because some version of these proposals might pass through the established neoliberal order. However, none of these proposals are likely to dent, let alone reverse runaway inequality. Instead, they might lead to more fairness for women and people of color at the higher professional levels. Why is Socialism Doing So Well in Deep Red North Dakota?